PHOEBE ZIMMERMANN: I’m Phoebe Zimmermann. STEVE EMBER: And I’m Steve Ember with the VOA Special English program PEOPLE IN AMERICA. Today we tell about an unusual man who had many abilities, Richard Buckminster Fuller. PHOEBE ZIMMERMANN: Building designer. Engineer. Inventor. Thinker. Poet. Not five people. Just one: Richard Buckminster Fuller. 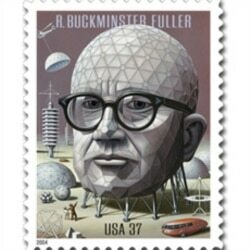 "Bucky" Fuller, as he was known, was one of the most unusual thinkers of the twentieth century. His aim in life was to make the human race a success in the universe. 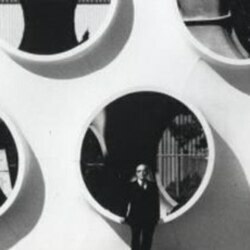 Bucky Fuller spent most of his life searching for new ideas. He also searched for unusual connections between existing ideas. He described himself in these words: "A complete, future-thinking design-science explorer." Fuller believed deeply in technology. Through technology, he said, people can do anything they need to do. STEVE EMBER: R. Buckminster Fuller died in nineteen eighty-three at the age of eighty-seven. During his long life, he discussed his idea about technology and human survival. He called his idea "dymaxion." It came from three words. Dynamic, meaning a force. Maximum, meaning the most. And ion, which is an atom or group of atoms with an electrical charge. Fuller explained the word dymaxion as a method of doing more with less. Everything he did was guided by this idea. He designed a dymaxion car, a dymaxion house, and a dymaxion map of the world. But he probably is known best for another invention -- the geodesic dome. A geodesic dome is a round building made of many straight-sided pieces. Talking about R. Buckminster Fuller means using strange words. This is because Fuller himself invented words to describe his ideas and designs. His designs were way ahead of his time. They still are. PHOEBE ZIMMERMANN: R. Buckminster Fuller was born in Milton, Massachusetts, in eighteen ninety-five. Bucky could not see clearly, because his eyes did not point straight ahead. So, his world was filled with masses of color without clear shapes. When he was four years old, he got eyeglasses to correct the problem. Suddenly, he could see the shapes of people's faces. He could see stars in the sky and leaves on the trees. He never lost his joy at the beauty he discovered in the world. As a child, Bucky Fuller questioned everything. He was a very independent thinker at an early age. His refusal to accept other people’s ideas and rules continued as he grew older. One result was that he never completed his university studies. He was expelled two times from Harvard University in Cambridge, Massachusetts. He thought his time was better spent having fun than studying. Yet Bucky Fuller was very serious about learning. He proved this when he joined the American navy during World War One. STEVE EMBER: In the navy, he learned all about navigation, mathematics, mechanics, communications and electronics engineering. He loved this world of modern technology. Soon after he joined the navy, he designed new rescue equipment. It helped save the lives of some pilots during training. Fuller's good navy record won him a short-term appointment to the United States Naval Academy in Annapolis, Maryland. It was there he first developed two ideas that were important for the rest of his life. While studying warships, Fuller realized that they weighed much less than buildings, yet were able to do much more. He decided better designs could also help humans do more, using fewer materials. PHOEBE ZIMMERMANN: In nineteen seventeen, Bucky Fuller married Anne Hewlett. Their daughter, Alexandra, was born about a year later. Bucky was a very emotional man, as well as an intellectual one. He loved his little daughter. She was the wonder of his world. Then Alexandra became very sick. The medicine to cure her had not been invented yet. She died at the age of four. Bucky Fuller blamed himself, although he had done everything he could to save her. His sorrow overcame him. He began to drink too much alcohol. Yet he continued to work hard. Fuller was head of a company that made a light-weight building material. He was not a successful businessman, however. And the company began to fail. He was dismissed by the owners. It was nineteen twenty-seven. His wife had just given birth to another baby girl. They were living in Chicago, Illinois. He had no job and no money. He felt he was a complete failure. STEVE EMBER: Bucky Fuller walked through the streets of Chicago along Lake Michigan. He stood silently on the shore. He considered killing himself. Then, as he explained later, he realized he did not have the right to kill himself. He said he had felt something inside him that day. He called it the Greater Intelligence or God. It told him he belonged to the universe. So Bucky Fuller decided to live. And he would live the way he thought best. He promised to spend his remaining years in search of designs that could make human existence on Earth easier. This began his great creative period. PHOEBE ZIMMERMANN: Fuller's first design was the dymaxion house. It was not built at the place it would stand. It was built in a factory, then moved. It did not cost much to build. And it did not look like a traditional house in America. Its roof hung from a huge stick in the center. Its walls were made of glass. It contained everything needed for people to live. Power came from the sun. Water was cleaned and re-used. Fuller then designed and built the dymaxion car. It looked a little like the body of an airplane. It had three wheels instead of four. It could go as fast as one hundred eighty kilometers an hour. It carried up to twelve passengers. Several companies were interested in building and selling Fuller's house and car. But his designs were so different, so extreme, that banks were not willing to lend money for the projects. So the dymaxion house -- which could have provided low-cost housing for everyone -- was never built. And the dymaxion car -- which could have provided safe, pollution-free transportation using little gasoline -- was never produced. STEVE EMBER: Bucky Fuller did not give up his idea of doing more with less. He had an idea for another building design. It would provide the most strength with the least amount of material. He began looking for the perfect shape. Fuller found it in nature. It appeared in the shapes of organic compounds and metals. The main part of his design is a four-sided pyramid. To create a building, many pyramids are connected to each other. The connecting piece has eight sides. Together, these two shapes create a very strong, light-weight rounded structure. The structure can be covered with any kind of material. And it can stand without any supports inside. Fuller named this structure the geodesic dome. It covers more space with less material than any other building ever designed. PHOEBE ZIMMERMANN: After a number of experimental geodesic domes were built, industry began to understand the value of the design. Today, there are about one hundred thousand different large and small geodesic domes in use around the world. However, no one yet has acted on one of Fuller's ideas for the geodesic dome. There are no limits to the size of a geodesic dome. So Fuller proposed using them over cities or over areas that had severe weather. A geodesic dome that size would make it possible to have complete control over the environment inside it. STEVE EMBER: Most of Bucky Fuller's inventions did not earn him much money. A lot of what he did earn he spent travelling around the world. He told anyone who would listen about his ideas for human life on this planet. He called the planet "Spaceship Earth." Humans, he said, are astronauts on Spaceship Earth. They are travelling one hundred thousand kilometers an hour around the sun. He said the Earth is like a large mechanical device that will survive only if people living on it know how to operate it correctly. People must live on Earth just as astronauts live in a spaceship. They must use their supplies wisely, and re-use them. Buckminster Fuller said humans are able, through planning and wise use of natural supplies, to feed and house themselves forever. PHOEBE ZIMMERMANN: This VOA Special English program, PEOPLE IN AMERICA, was written by Marilyn Rice Christiano. It was produced by Lawan Davis. Our engineer was Sulaiman Tarawaley. I’m Phoebe Zimmerman. STEVE EMBER: And I’m Steve Ember. Join us again next week for another PEOPLE IN AMERICA program on the Voice of America.